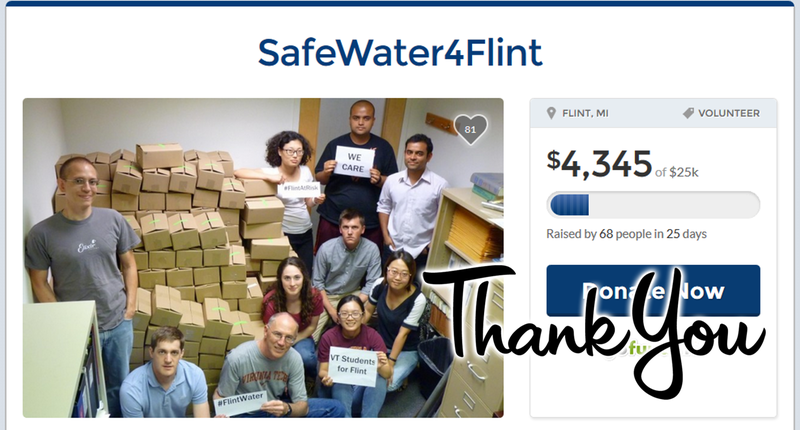 HomeSafeWater4Flint Fundraising Update and Thank You! We are very grateful to the 68 generous contributors who helped raise $4,345 through our SafeWater4Flint fundraising campaign.The funds have been donated to the United Way of Genesee County who are spearheading filter distribution in Flint. We anticipate this money will provide filters to about 200 homes. As of today, we are shutting down the GoFundMe campaign, and request future donations go directly to United Way on their donation page here. We are glad we setup the first fundraising campaign, and are thankful for the love and appreciation we received from Flint residents. We also commend the efforts of United Way of Genesee County, Senate Minority Leader Jim Ananich and his team for their public information efforts, the Governor’s office for pledging $1 million to buy NSF-certified filters, and all donors for their generosity. In the end, we wish to emphasize that filters are a temporary solution, and urge the authorities to place the health and well-being of Flint residents and their children above all else when deciding upon a steady long term solution. While we fail to understand how issues of accountability in the Flint water crisis are “relatively complex” considering what we and ACLU-Michigan have uncovered, we at least hope to see a speedy resolution to this “public health emergency” in the coming days. ← Investigation of MDEQ’s new “Corrosion Control” claim reveals more deception and incompetence: Where is the EPA? Thank you so much for the time you all have invested. I am very happy I was able to be a small part of this.